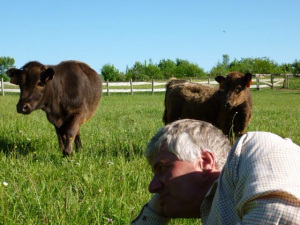 You may remember that Roger decided to expand our animal base whilst I was in the UK back in spring 2013, and bought two large Dexter calves, Buttercup and Daisy. During the summer they proceeded to grow gently, develop the start of a fine pair of horns and wonderful winter coats, they grazed quietly and were much admired by local farmers who had rarely seen such tiny cows – the local breed being the won named Blondes d’Aquitaine, and are ‘proper’ sized cows rather than short legged miniatures. A memoir from Molles: Self-sufficiency or a just a way of life…..